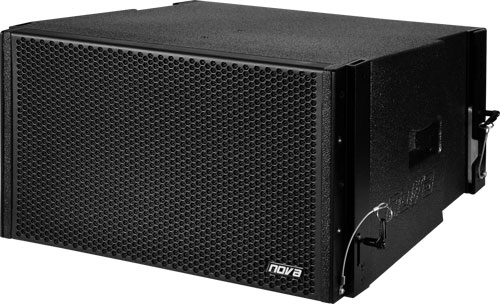 The EL10 is a two-way high performance line array speaker in a trapezoidal chassis for fixed installations and mobile use. The cabinet is equipped with two 1" HF drivers (1,75” voice coil), which are mounted onto a wave guide. The nominal coverage is 100° x 10° (H x V). The MF/LF section is equipped with one high-performance 10" speaker (3” voice coil), which is hornloaded. The 10” transducer is contructed behind the wave guide of the high-frequency section (coaxial construction). The EL10 can be flown in vertical colums with up to 12 units per side by using the EC1 flyframe. The angle between each EL10 can be adjusted from 0° up to 7,5° in steps of 1,5°. The EL10 is compatible with all other ELITE models including ELITE subwoofers. Up to four EL10 can be directly stacked onto the E18SUB subwoofer without any adapter or additional frame. The chassis is constructed from 15 mm plywood (birch) and covered with black PolyCoat© finish. The cabinet is equipped with two grip handles and one front grill with transparent charcoal foam backing. Two speakon connectors (NL4) are mounted at the rear side of the chassis for signal input (input) and signal link (link). The power rating of the EL10 is 400 W (RMS), the impedance is 8 ohms. ECOX | Run-Time Correction. Picture shows EL15, which uses the same technology.